Do you work from home? I know more and more jobs are offering the option to work remotely, and I'm fortunate to be able to work from home three days per week. That means I only have to brave Dallas traffic twice per week, which is amazing, but working from home poses its own challenges. When the babies were born, I gave up my home office so they could have a play room. It was 100% worth it, but I soon noticed that I was feeling more stressed and irritable on the days when I worked from home. I was doing most of my work from the bar stools at our kitchen peninsula, which meant I was trying to keep up with my job while sitting in the middle of a messy kitchen all day. Dirty dishes in my sink. Crumbs all over the kitchen table. High chairs covered in toddler mess. That's not the best environment to work in, and it was constantly reminding me that I was behind on my chores, behind on my emails, basically just behind on everything in my life. No wonder I was irritable! 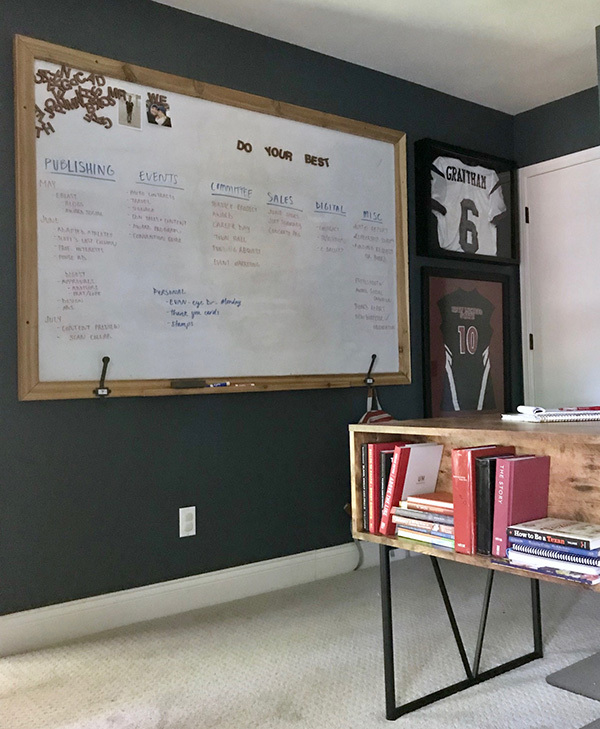 I realized the easiest thing to do would be to take one of our guest rooms and make it into a legitimate home office so that I can separate from my home life and focus on my job, even when I'm working from home. We created a simple, clutter-free work space (no dirty dishes!) that suits both of us, and my teleworking days have been much more pleasant! This room is really hard to photograph because it gets bright light from the windows but also has dark walls, so an amateur photographer like me has no idea how to handle those challenges. But I figure you can get the general idea from these photos. We painted the walls Hematite by Valspar, which is one of our favorite colors. We also used it on our front door and shutters, plus a few pieces of accent furniture. I would describe it as a very deep gray with some hints of navy. It goes with everything! 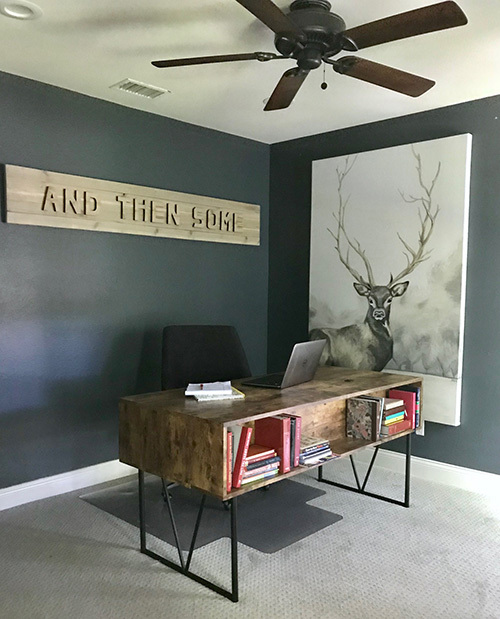 It creates a perfect backdrop for some simple art, like my deer painting and the And Then Some sign Scott made to honor my dad. On the other wall we have a giant magnetic white board that Scott installed a couple years ago. If you don't know, my husband is a high school football coach and he used to use this board a lot to draw up plays and write out practice plans. Now that he has all of the same white boards in his office at work, I've taken over the white board with my own to-do list. 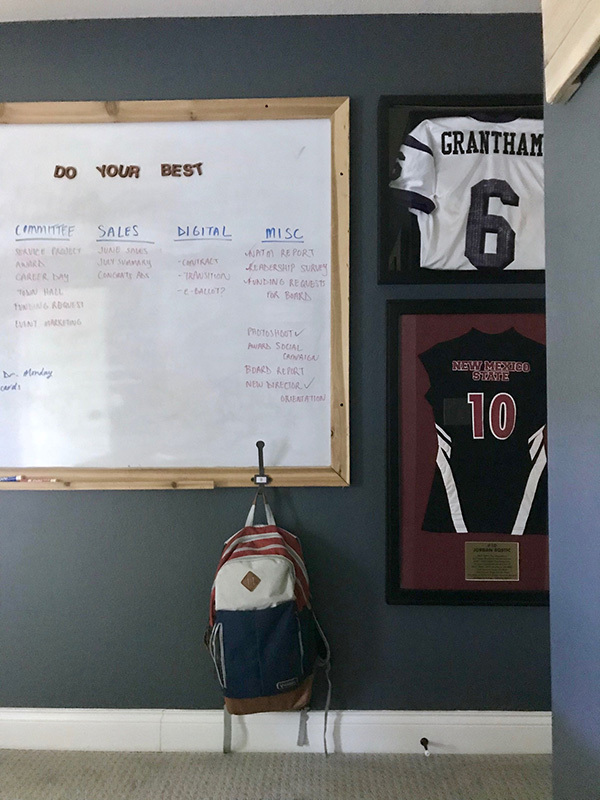 We also hung up our former jerseys behind the door because they hold some really precious memories for me. Opposite from the desk, we found this mid-century cabinet on Facebook. It's the perfect size and has exactly what I wanted: concealed storage for office supplies. 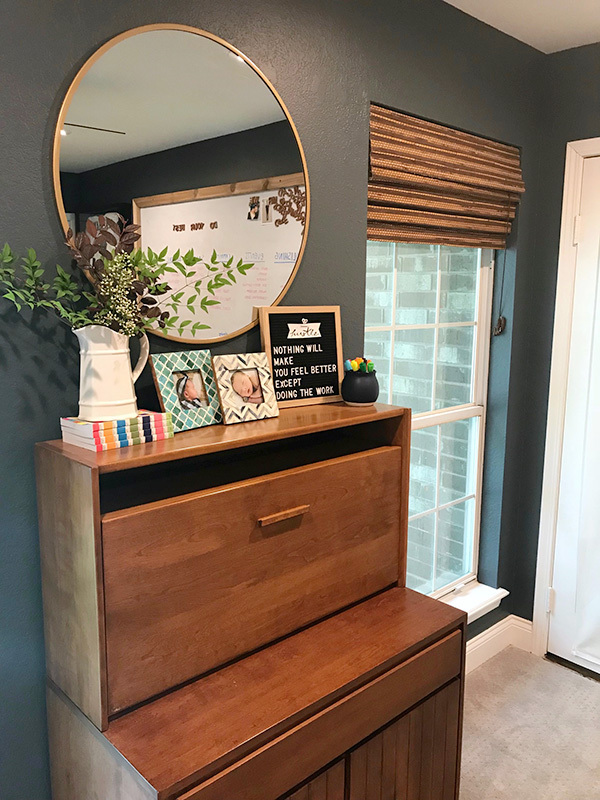 The front flap actually folds down and makes a desk, and it's a great surface for my to display the family photos and felt board messages that make me smile when I'm stressed about work. It's a simple step, but creating a dedicated workspace has really improved my days when I work from home. My desk faces the windows that overlook the backyard, so I have a great view of our backyard makeover (the synthetic grass is bright and green all year round!). We have squirrels, birds and other animals that frequent the creek behind our yard, so things are always catching my eye out the window and brightening my day. One day I even undertook a fox rescue mission with our local animal control because I saw the most beautiful fox limping through the creek with a metal trap on its leg. Create a dedicated work space. It doesn't have to be a separate room, but I think the idea should be to separate yourself from your chores so you can focus on the task at hand, just like you would if you drove into an office. Put on shoes. I know this sounds so silly, but I've always felt that my day doesn't start until I put on shoes. And house slippers don't count! Ignore your chores. Nothing distracts me from my work like "just putting in a load of laundry" or "quickly taking out the trash." It has been such a relief to allow myself to simply focus on my job instead of trying to multitask between my home life and work life. If I simply MUST put in a load of laundry, I save it for my lunch break. What are your best tips for working from home?